You may want to watch FaceBook videos offline on Mac computers to avoid any interenet issues. Now, from macOS Sierra, Siri can even help you get FaceBook locally if you have a video downloader for FaceBook installed. What make things a bit awkward is that there's few FaceBook video downloaders fully compatible with the latest macOS High Sierra/Mojave available yet if you've upgraded to macOS High Sierra. Based on reviews and testimonials, these are top video downloaders that work well on macOS 10.13/10.12/10.14, with which you can free download FaceBook videos HD 4K on macOS seamlessly. MacX Video Converter Pro is the fastest program to free download FB videos on macOS 10.12/10.13/10.14 on the list - it only takes several seconds to download a 5-minute FaceBook video. 8K, 4K UHD, 1080P, 720P SD, VR 360, 3D Blu-ray, MP4, FLV, AVI etc. video downloads is all supported, with the highest quality kept. The video downloader for macOS Sierra also serves as a FaceBook video converter that is able to download FaceBook video on macOS Sierra/Mojave based MacBook Pro/Air/iMac to MP3, MP4, AVI, 3GP, MOV, WMV at the same time. The FB downloader has clutter-free interface, making it simple to free download FaceBook videos HD 4K on macOS. Step 1: Free download the FB downloader on mac and launch it. Click "YouTube" icon on the main interface, yes, YouTube, which will direct you to FaceBook video download page. Click "Add Link" button, copy and paste FaceBook video URL to the box frame, then click on "analyze" to load the FB video info. Step 2: The FB video will be loaded and analyzed by the macOS Sierra FaceBook video downloader quickly. From the popping-up window, choose FB video format, res, file size, codec to download. You can check the "Auto add to convert list" if the original FB format is not what you want, and the FB video converter downloader can do the conversion task for you. Step 3: Hit "Download Now" button to start to download FaceBook videos of MP4, AVI, MOV 4K UHD 8K on macOS Sierra-Mojave based MacBook Air/Pro/iMac. It empowers you to download video from YouTube, Vimeo, Dailymotion, Vevo, Pornhub, Xnxx, 300+ sites easily with fast speed. After the FB video downloads on macOS Sierra/Mojave is finished and the "Auto add to convert list" option is selected before (step 1 can be ignored then), the FaceBook downloader for macOS Sierra/Mojave can download and convert FaceBook video to MP4, FB to MP3, AVI, MOV, MKV, WMV, FLV, etc. any format or directly to YouTube video format, FB video format, iPhone, iPad, iPod, Samsung Galaxy etc. The Output Profile window provides access to choose FaceBook download video format as output. 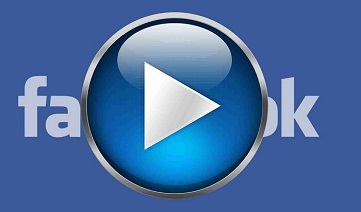 Click "RUN" button to start the FB video conversion process. The Facebook HD video downloader for macOS Sierra delivers easy ways to edit FaceBook videos, for example, compressing video file size, adding SRT subtitles/watermarks, adjusting video parameters, frame rate, bit rate, aspect ratio, and more. Plenty many free FaceBook downloading apps for macOS Sierra/Mojave nags you until you cough up money to buy it, or have ads, virus, spam. But MacX YouTube Downloader is clean and safe video downloader freeware for FaceBook vdieos. To download FaceBook video on macOS Sierra, just copy and paste video URL. It delivers the same performances as the fastest FaceBook downloader for macOS Sierra/Mojave introduced above does, only with limited options. The free FaceBook video downloader for new macOS supports FaceBook VR 360 HD 4K 8K video downloading. But there's no FB video conversion function. If you don't want to bother yourself to download software on macOS Sierra/Mojave, here's another way to go: use online FaceBook videos downloader for new macOS. The online FaceBook video saver allows you to select FB video quality, 360p 480P 720P SD, 1080p HD, 4K, 8K and VR 360 is not said to be supported on its official site. To download FaceBook video on macOS Sierra, add-on/extensive is required to be installed on the new system to catch FB video successfully. Besides, it also serves as a good YouTube downloader for macOS Sierra. Note: the free online FB video downloader for macOS Sierra shows many puzzling download buttons on its main interface, most of which are fake FB video download links. Check the file extensive before you download and save FB video movie clips on macOS Sierra. It works OK in FaceBook video free downloads on macOS Sierra, but not great. In fact, Miro is music video player. The free FB downloader lets you save videos from FaceBook via torrents, bittorrent(maybe illegal in your country). So, it's not safe when it comes to FaceBook video torrent downloads. The best part of the FaceBook downloader for macOS Sierra/Mojave is that it's open source and being updated from time to time. In addition, it can play downloaded FaceBook videos music movie clips. But it sounds not that appealing as it's risky. It's the last way to go. Which FaceBook Downloading Progam for macOS Sierra/Mojave to Choose? Which is the best to free download FB videos on macOS Sierra/Mojave? 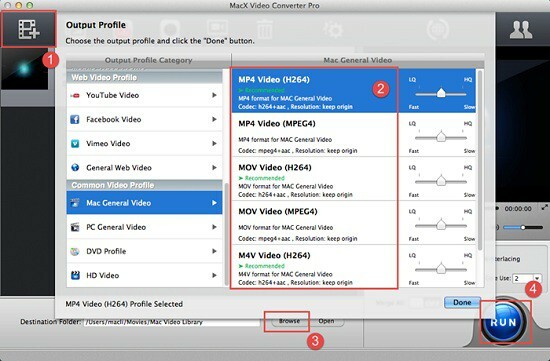 MacX Video Converter Pro is rich in features (download, convert, edit), fast in downloading speed and the most reliable FaceBook 4K/HD video downloader for Sierra here. 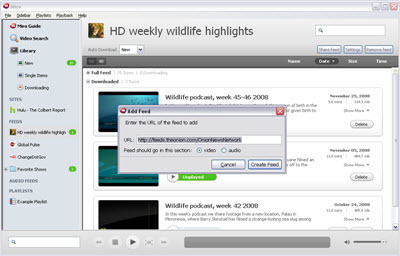 MacX YouTube Downloader is free and fast but limited in function. 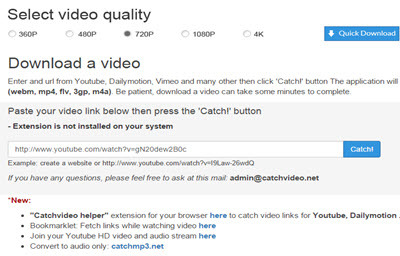 Catchvideo and Miro can do the FaceBook video free downloads job on macOS Sierra but they are at high chance of throwing out virus, malware. Here we don't encourage or condone the illegal distribution of copyrighted content from FaceBook. Please download FaceBook video on macOS Sierra only for non-commercial use.